Hey everyone, my names chris I'm in lethbridge. IM new to the volvo scene and just picked up a 1984 242 turbo. The car has been sitting or 18years now, and id like to try and make it run again. Is there anything i should do to bring the kjet system back to life? Or anyone on here that works on kjets? I lucked out with my car, I'm the third owner, it came with all paperwork and repairs from new in seattle. It is a 4 speed standard with overdrive, leather interior, power everything, ac, sunroof turbo car. Its nearly 99% rust free and dent free. Any advice on the best way to get this old girl running and mobile again would be greatly appreciated! Sorry not sure why the picture is so massive. I suppose I'd be the closest thing to a K-jet expert (know-it-all?) we have around here. Anyone who wants to challenge me for this "thrown" (intentional misspelling) is welcome to it! K-jet is pretty simple and reliable, but unfortunately it suffers from disuse and ethanol in the fuel more than anything. 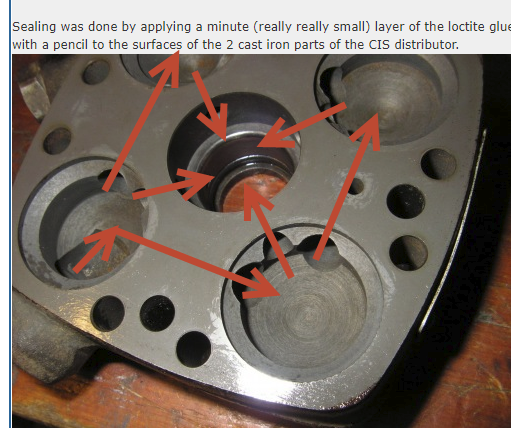 The rubber parts can crack, the ethanol can eat at some of the metal parts and granules of crud can clog up the fuel distributor jets and/or make the injectors' spray pattern a little wonky. Your car has an in-tank low pressure fuel pump sucking through a sock filter and feeding a high pressure fuel pump under the car. That pump sends fuel at 75-80 psi through a check valve, to an accumulator, and then up under the car to the fuel filter and then on to the fuel distributor. The fuel distributor contains the line pressure regulator (maintaining that 75-80 psi pressure drop) and splits the fuel up in a few directions. The first direction (from a cold-start point of view) is to the (blue) cold start injector situated in the intake manifold. This is electronically triggered by a signal from the starter circuit through the thermal time switch. The thermal time switch is opened up by heat - heat from the cooling system as well as heat through a resistive circuit that will open the contacts after a certain amount of cranking. If the engine coolant is above a certain temperature, or if you've been running the starter/cold start injector for more than about 10-15 seconds at a time, the thermal time switch will open up and will no longer operate the cold start injector. The cold start injector provides enough fuel to make the engine at least try to run even when nothing else works... but it won't stay running after you cut off the starter motor. Combining the airflow plate, the fuel distributor, and the main fuel injectors, you get a very clever system of metering fuel. Here's the inside of a fuel distributor (not mine, though I have rebuilt one similar). Spool cylinder fully seated in the upper chamber, with filter screen covering the inlet. The tip of the jets are flush with the bottom machined surface of the chamber. The upper and lower chambers are separated by a stainless plate, sealed off on both sides. Fuel pressure in the bottom chambers (first picture) holds the plate against the jet, stopping flow. When enough fuel is metered into the upper chamber, the pressure pushes the plate off the jet and a tiny burst of fuel heads to the injector before the plate is pushed back to the jet. There are springs that push down on the stainless plate to assist the metered fuel in pushing that plate down. This is what the trim screws adjust: the preload on the springs. Here's the upper chamber, spool valve, and springs with the stainless plate assembled, and the lower chamber. You can see Buddy is reassembling an old one and he's got the plate flipped, as evidenced by the brinnell marks where the spring seats sit and where the plate has been slapping against the jets for the past 30 years. The problem on high-mile fuel distributors is that the plate deforms where it contacts the jet, and it has a hard time metering the fuel accurately (it stops sealing properly against the jet). Fuel flows out of the four individual ports around the top of the fuel distributor and to each of the injectors. The injectors are nothing more than pressure relief valves that allow pressure to build high enough to puff into the intake port in a fine spray. Much like a diesel, the fuel distributor meters the amount of fuel the engine gets, not the injectors, but the injectors do control the quality of spray and only to a VERY small amount, the amount of fuel. 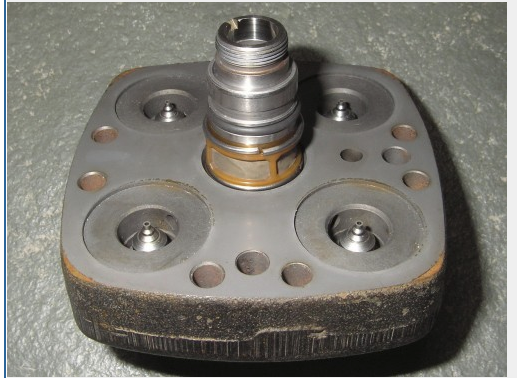 There is a TINY little hole in the plate between the two fuel distributor halves that allows fuel to flow up to the top of the spool valve piston and out the top port. This goes to the control pressure regulator / warmup regulator on the side of your engine block. There is a bimetallic sprung regulator inside that reduces control pressure when cold, providing less force pushing down on the spool valve. This lets the airflow plate lift the spool valve higher, creating increased flow to the injectors. There is an electric heating element and the control pressure regulator also gets heat radiated to it from the side of the engine, and these combine to adjust the control pressure. (In your case there is also a vacuum system that affects the control pressure. Depending on your car being an intercooled Turbo or not, there are two options. The non-intercooled cars will have a blue Ported Thermal Vacuum Valve on the cylinder head that takes vacuum from the intake manifold and when cold, allows it through to a tee fitting. 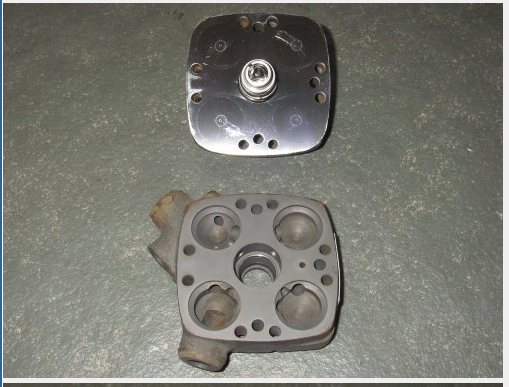 One half of the tee fitting goes to the "top" port of the control pressure regulator and the other goes through a delay valve and then to the "bottom" port". The theory being that when cold, a sudden drop in manifold vacuum will increase pressure on the top of a diaphragm while the delay valve delays that pressure from the bottom for a couple seconds. Until the delay valve lets the pressure across the diaphragm equalize, the diaphragm pulls down on the bimetallic spring and reduces control pressure temporarily, richening the mixture. If your car is a factory intercooled car the vacuum goes from the manifold through the same Ported Thermal Vacuum Valve and to an electronic dashpot, which triggers Terminal 11 in the ECU. More on Terminal 11 in a bit). In the same pressure circuit as the control pressure regulator is the Lambda system control valve. This looks like an electronic fuel injector strapped to the side of the airflow system, and the Lambda system in the car sends a continuous bandwidth of pulses to this injector which helps regulate the control pressure in response to the needs of the system. Increased duty from the Lambda computer results in more fuel bypassing the control pressure regulator, lowering the control pressure, and increasing the fuel flow. In the 240 Turbo cars, this system is also set into two fixed pulsewidths by various conditions: Terminal 7 is triggered by a low pressure boost switch (1-2 psi) and this turns off the Lambda feedback system and at the same time sets the Lambda duty cycle to about 70% end enriches the mixture for boost; and Terminal 11 (mentioned above) does the same but sets the mixture even richer, to about 90% duty. Below a certain coolant temperature the Lambda system is locked at about 50%. Yes, even the non-intercooled cars have Terminal 11 and yes, you can trigger that circuit with another pressure switch for even more enrichment. The control pressure regulator, the Lambda valve, and the line pressure regulator all dump into the low pressure side of the fuel distributor which is connected to the return line, and back to the fuel tank. The airflow plate is pretty reliable but it must move smoothly. It can get gummed up but is easy to disassemble and clean. Often crud will fill up the 3mm hex screw socket and will prevent you from being able to easily adjust the mixture. This is about the only user-serviceable part in most cases. Starting is often impacted by the residual pressure in the system. The whole system must maintain fuel pressure for a good 15-30 minutes after shutoff. I've found that if residual pressure drops too quickly and if the engine is hot, the fuel boils in the injectors and injection lines and pushes fuel back to the tank. If the engine is still warm these lines will be filled with vapour and the engine will be reluctant to start, and the thermal time switch won't let the cold start injector squirt so the engine may crank and crank for a while without much happening. If the engine has cooled off again the cold start injector will bark the engine to life but one or more injection lines could still have vapour in them so the engine will miss on a few cylinders. If the engine is dead cold the vapour usually condenses and pulls fuel back into the lines and the car tends to spring to life without hesitation. To resurrect your car, I would say that the first step is to drain the fuel tank of old gas. Hopefully it hasn't varnished up because that'll screw everything up. You can pull the in-tank pump through the access panel in the trunk to check on both the quality of the inside of the tank and the condition of the pump & hoses. There is a short hose between the pump and the pickup/return/level sender assembly and if that hose fails your main pump will only pull fuel from the top half of the tank, and won't be happy about it. Test the in-tank pump to see if it works, and replace the hose while you're in there. Stuff it all back together. Head to the engine compartment and change the main filter - this requires some big wrenches, most of the time, and the replacement filter rarely fits into the hook bracket thingie. An option at this point is to leave the filter disconnected at the outlet and jam a hose in there and down to an empty jerry can. You can then jumper the fuel pumps directly from the fusebox - connect circuit #3 to #5, or #4 to #6... I forget exactly, but I know it's something like that They're two circuits apart and are not TOO near the top of the fuses. This should kick both fuel pumps on, and if you've filled up the tank you can check for flow at the outlet of the filter. Hook up the filter, run the pumps again and check for leaks. At this point you could pull the fuel injectors out of the head and stick each of them in Corona bottles. Remove the "cobra" (the hose between airflow plate and turbo) and run the pumps. Grab onto the bolt at the center of the airflow plate with a pair of pliers and lift up - the injectors should all be squirting, eventually, evenly and with at least 1/3 of a full cone of fuel. If any are dribbling or streaming, you can remove the injectors and soak them in carburator cleaner for a day or so, and blow them out with compressed air. This may be enough to open them up, and it may be a good idea to start with. These suckers will be on tight so spray them with PB blaster or whatever and use two wrenches after removing them from the head. DO NOT twist off, mangle, bend, or stretch the hard lines!!! This may or may not be obvious, but this system is terribly sensitive to leaks, both vacuum and fuel. Fuel is a safety issue but is easy to spot, while vacuum leaks will DRIVE YOU BATTY. Any leak at the fuel injector bosses, vacuum fittings, hoses, gaskets, etc, will cause the car to run strangely. Fuel leaks are rare but they do spring up (haha). I can give you a source for new nylon tubing and a procedure for replacement, as well as a source for the fuel distributor rebuild kit. Assuming you've got spark and compression (and oil), the car should fire up once you stick it all back together. Once it warms up you'll likely hear a buzzing noise from below the cobra - this is the Lambda valve - and it'll either be cycling up and down or buzzing steadily. You can test the oxygen sensor with a multimeter set to 0-2v range and jamming the positive into the O2 sensor spade connector - ideally it'll cycle up and down from about .05v to .85v, and the Lambda valve buzz will cycle along with it. If your multimeter has a dwell setting you can go over to the driver side strut tower and you should be able to find a loose connector with ... green/white and red? ... wires, female spade connectors. Hooking the multimeter to one of those wires will show nothing, to the other will show you the duty cycle of the Lambda valve. With the engine warm, you can adjust the airflow plate so the duty cycle averages at about 50%. There's a whole goofy idle control system on the turbo cars as well. It works quite well but there are temperature sensors and microswitches and stuff to go wrong, but even without that junk working the idle controller should hold a rock steady 900 RPM. The Haynes manual suggests there's an electronic adjustment potentiometer but I've never found it. Once upon a time I had a system that decided to double the idle speed to 1800 RPM and hold it there... replacing the control unit was the cure. The ignition system is the same as the naturally aspirated cars except for the advance/retard dashpot in the distributor - it should pull out around 6 degrees within the first 1 or 2 psi of boost and stop there. Yes, this can also be modified. If your car is factory intercooled it should also have a solenoid & "controller" that opens up a boost leak at the wastegate above ... 3750 RPM? TL/DR: go back to the top and read this for real - lots of information contained within. Forgive me if I've covered something you're familiar with. Gaskets in these cars don't tend to fail, they're of high quality stuff. Rubber is normally the issue. 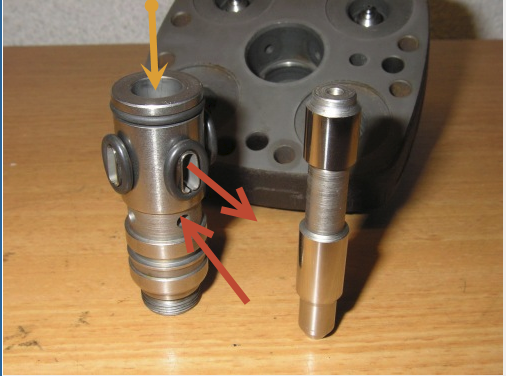 The fuel injectors sit in holders, the injectors have big unique o-ring seals between them and the holders and the holders themselves have thinner, larger diameter o-rings between them and the head. Replace all 8 and you'll solve most of your vacuum leaks. That, and any plumbing downstream of the turbo compressor - it tends to get pretty oily and the oil swells and softens the rubber. Check that stuff out and if in doubt, replace it. Speaking of rubber, and 240s, the motor mounts on these things are often squishy, sagged out, or separated. The 240 has plain old rubber mounts but at least the passenger side is under the heavy part of the motor and is also more likely to be covered in oil. The driver side is normally the one that fails outright, though - it's under tension when you launch the car one of the plates normally separates from the rubber. They're cheap and not terrible to replace, but due to the design they can be finicky to align if you don't take the mount completely off the engine, which you'll probably have to on the passenger side. You can get heavier duty rubber ones but they're so close together under the engine that mounts stiff enough to control engine rock (and these engines DO rock!) will transmit a lot more vibration. While you're buying bushings, get a bunch of poly accessory bushings: three for the alternator, three for the power steering, and whatever your car needs for air conditioning if equipped and functional. As with all things rubber, stay away from Scan-Tech. There's a good chance that your rear axle bushings will be wallered out too. 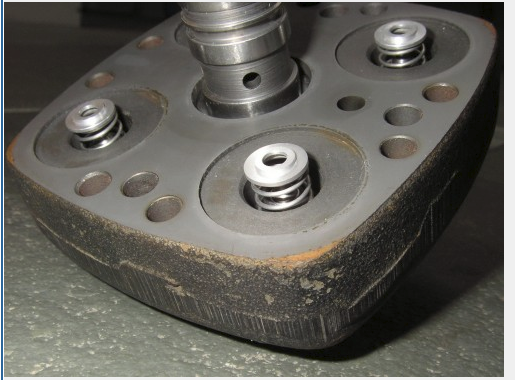 Replacing with rubber is fine, or you can do Poly in which case you don't need the bushing removal tool but you WILL have a lot of work ahead of you getting the rubber out of the bushing shell, but to replace with rubber you really want the proper tool for the job. The torque rod (upper rear axle links) bushings are also quite soft from the factory and you can either replace these with poly, or if you plan on lowering the car you can get adjustable arms. Your front control arms mount into buckets at the rear and these are usually pretty solid, but replacing with poly firms things up a bunch. I've run my 240s on full poly and the ride wasn't degraded much in my opinion. Before you mess with the suspension, though, check on the forum to see what people have to offer. There are various sway bar sets, shocks & struts, and other pieces kicking around. Lots that you don't have to pay new prices for. There is at least one more achilles heel of the 240 that I need to address: Wiring. From the early '70s to the late '80s, Volvo used the worst wiring harnesses known to man. About 10 years ago we saw hundreds upon hundreds of really good 240s in the junkyards, and I swear the only reason why they weren't on the roads was because of the engine harness. The first sign of trouble will be at the big grey rectangular connector at the firewall behind the intake manifold - the wires will probably be bare in some places. LUCKILY the 240 doesn't need good wiring to run most of the time, LOL. You can get a good quality replacement harness fairly inexpensively from http://www.davebarton.com/ (WARNING!!! This is the worst website known to man, but Dave has a ton of good parts and information!) The majority of the Turbo-specific wiring (including idle controller) runs through a separate harness from the engine and I *think* the Turbo harness stands up a bit better since it's out in the open and doesn't get much oil dripped on it, but I also think Dave's got these available. But once you get your car, take it, 5 or 6 cans of engine cleaning spray, and about $20 to the car wash and get yourself covered in filth while removing as much as you can from the car. Then start a build thread on the forum!!! POTY and it's only January. You seriously should write a k-jet for Jim/Dummies book. oh, novaskilling, welcome to CVC. We're small, but as you can see have some VERY knowledgeable people here!! Hey thanks man! Yah matt is the bees knees for jet knowledge, and craig has been an amazing help. This club from what I've seen is full of super cool guys willing to share and help. Would love to drive to a meet if there ever is one. Jayzooz Matt, please tell me you copy/pasted most of that from the archives! Welcome Chris, and great score! 242...actually most 240s are getting impossible to find in this condition, I hope you treat it right! That should be a great little car when it's done. Reminds me fondly of my old project car.